PCI DSS’s security policies and procedures apply to all organizations that store, process or transmit payment card data—protecting cardholder data from misuse or theft. IBM BigFix Compliance PCI Add-on is designed to help organizations enforce continuous compliance with PCD DSS throughout the entire organization for every endpoint, both on and off the corporate network. Based on the BigFix platform and BigFix Compliance methodology, PCI Add-on simplifies monitoring and reporting of PCI compliance through PCI DSS-specific policy compliance checks and specialized dashboards to report compliance posture and identify risk areas. Provide PCI and platform-specific checklists with more than 3,000 checks to greatly reduce PCI requirement mapping, implementation and management efforts. Continuously monitor security configurations of all endpoints, report compliance drift immediately, and remediate incompliant endpoints effectively. 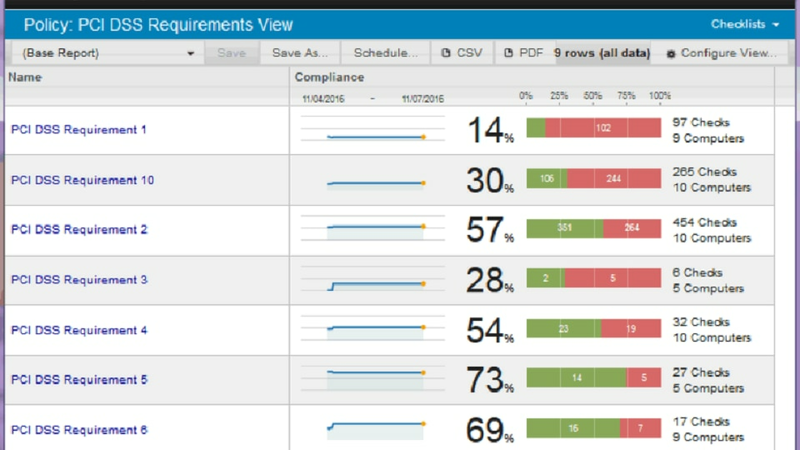 Specialized dashboard lets you report overall PCI compliance posture and identify risk areas or endpoints efficiently.